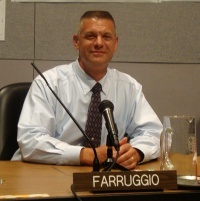 Farruggio moved to Charlottesville in 1988 to become a police officer with the Charlottesville Police Department. He was appointed to the Charlottesville Planning Commission in October 2005, and his term expired on August 31, 2009. Farruggio said he stepped down in order to spend more time with his young children. He announced his candidacy on April 25, 2013 along with his running mate, Buddy Weber. ↑ Web. City fields 2 GOP candidates for council, Aaron Richardson, Daily Progress, World Media Enterprises, April 25, 2013, retrieved April 29, 2013. This page was last edited on 10 October 2018, at 20:08.